Anytime Instagram lets pop up one of Jason Lee recent shots it is like pushing a cassette of an Americana playlist while you are sitting in one of those cars with a long hood and worn out seats. The American photographer Jason Lee was born in Orange, California and he is well known for having been a professional skateboarder during skateboarding very pivotal period of late 80s and 90s. During the skateboarding years, photography was mostly an interest than a career path, after all being in that environment of skaters, artists, photographers, musicians that “it gets into you and everything you take on after that it feels the most appropriate. It felt totally organic to get into something like photography” Lee said. Meanwhile he started a career as an actor and only after 2001 when he picked up a couple of professional film cameras, he started shooting regularly. He started looking around the set, paying extra attention to the camera and the lights and started picking the brain on the camera guy. With his Mamiya RZ67 he went through a lot of Polaroid and Fuji pack film sheets using the film to practice metering and test various filters it was nonstop. Soon, he finds an unforced, more natural way of shooting, a spontaneous manner that was uniquely inspiring to him. It’s a Henry Wessel’s retrospective at SFMoMa to solidify this spontaneity. Wessel was a component part of the great development of photography which flourished in the 1970 depicting vernacular American scenes with the black and white Tri-X film. After that moment Lee found exactly what he’d been looking for: just shooting life as it is, not forcing anything and trying to find interesting the so-called mundane that makes of Lee the Flaubert of photography. At that point he was more or less addicted to road tripping, interested in shooting only for the joy of it, and the fulfillment of curiosity. The road is a source of inspiration and film is the media to document the “what’s there” in rural landscapes with 4x5 or 8x10 or around a city with his Polaroid Land Camera 250. Aside occasional portraits he prefers not to stage anything. 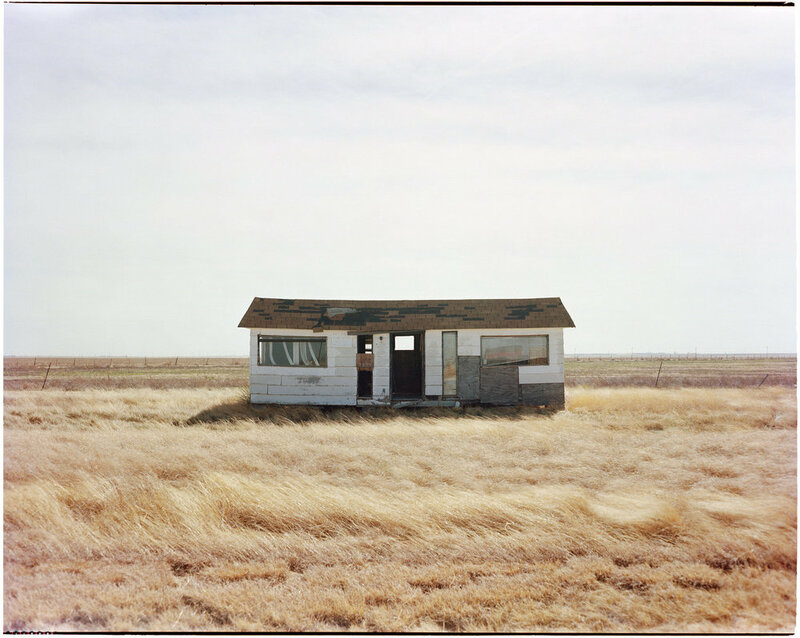 The subject of his shots is the dust-covered America with its abandoned gas stations, motels, barren landscapes, everything that at first glance is unattractive but which may gain value thanks to photography (or art in general). Lee is great in place value to the neglected and forgotten, to ordinary everyday scenes. He makes this with an extraordinary nonchalance leading us to admire these banal and odd landscapes in a temperate palette. When we talk about photography, we use to put the stress on the shot which is the final result of a long work. In Lee’s work, we should highlight the process that in this case is the American road trip experience. The word ‘road’ looks crucial in all Lee’s work, just be on the road is invigorating and inspiring. The love for the road and these inconsistent landscapes stands out in each interview. The way Jason Lee looks at the landscape, before putting his head under a tartan plaid which covers his large format before shooting, is passionate. The way he talks about the road is likewise passionate.